Three pewter metal miniatures of Achtung! Cthulhu Black Sun Nazi Villains in 28mm scale. Achtung! 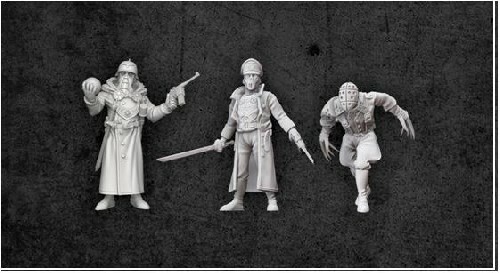 Cthulhu miniatures are scaled to sit alongside other popular World War Two miniatures ranges. Comes with 3 x 30mm round display bases with raised lip, some assembly maybe required. Includes a Black Sun Master, a Canon & Der Tote Guard. Black Sun are the occult based faction of the Achtung! Cthulhu universe, using ancient power and alliances with terrifying creatures to further their evil goals.